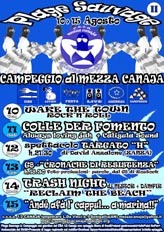 From the 10 to the 15 of August will take place the second edition of the free and alternative camping in the social center Mezza Canaja, in Senigallia (AN) on the italian Adriatic coast. The place is 5 meters from the Adriatic sea beach and is an autonomous and squatted social center. After our participation in the protests against g8 in June in the frame of the Global Meeting Network we want now to open another space for sharing, discussion and having fun together. On the thirteenth of August we will talk about the last G8, for valueing the future prospective concerning on European movement.